For the conference participants who require Singapore visa, you can find detailed information at http://www.ica.gov.sg/. If you need an official supporting letter from IRC or have any visa-related questions, please send a request to IRC manager through irc@bmsi.a-star.edu.sg. 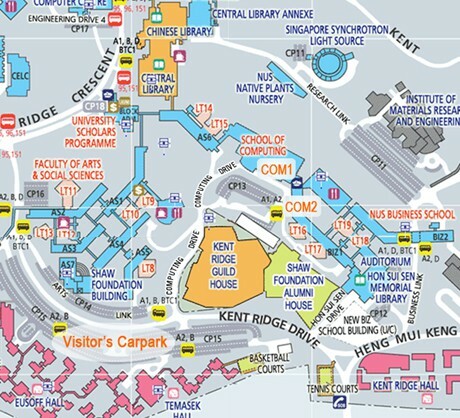 From the Singapore Changi Airport, there are a number of ways to get to the city and to NUS School of Computing. (Address:Computing 1, Level 2, School of Computing, National University of Singapore, 13 Computing Drive, Singapore 117417 ). The 2 most convenient are by (i) Taxi/Cabs and by (ii) Mass-Rapid Transit (MRT) Train System. Upon boarding a taxi, simply tell the driver your hotel with address or NUS destination, and the driver should take you to your destination accordingly. Travellings times are about 45 minutes to an hour. You can also travel to the conference venue at NUS via our MRT train network. The starting train terminals are at the basements of Terminals 2 & 3 at the airport. (CG2: Changi Airport Station) Travel via the network to NUS (CC24 Kent Ridge Station). You will have to alight at (EW21/CC22: Buona Vista Station) for a change to circle line .From the kent ridge station, take free shuttle bus(Bus No A1) to reach computing 1 building(Please refer to http://www.smrt.com.sg/Trains/NetworkMap.aspx for the train map). Travelling time are about 50 mins. There exists alternative forms of transport, such as car rentals and shuttle services. Please refer to http://www.changiairport.com/getting-around/to-and-from-the-airport for further information.